Germany is well-known for developing high-quality vehicles whether it is civilian or military. Their latest range of armoured vehicles further reinforces that statement. German tanks, armoured personnel carriers, and infantry vehicles have proven themselves and have shown that they are among the best in the world. Their new Puma Infantry Fighting Vehicle is an excellent piece of engineering which provides a balance between firepower and protection and incorporates cutting edge technology to make life easier for the soldier. This article covers the Puma IFV in detail, so sit back and enjoy reading it. Each country assigns a different role for a similar kind of vehicle and uses them in different ways to suit their doctrines. Many IFVs are designed so that the soldiers can fire their weapons from the inside through side firing ports and in turn sacrifice protection by using light armour. But the role of the Puma is to deliver the troops to the battlefield in a highly protected vehicle without any firing ports, disembark them in the battlefield and provide fire support from a distance. This calls for a vehicle with excellent armour and a main gun that can provide heavy fire support with precision, and the Puma is designed to do just that. It can operate in tandem with the Leopard 2 tanks if the battlefield scenario calls for it and can play the anti-infantry role effectively. It also can act as a tank destroyer if equipped for the role. The Puma is powered by a 1073 HP diesel engine which makes it more powerful than some tanks in service. It has a crew of 3 – driver, commander, and gunner. 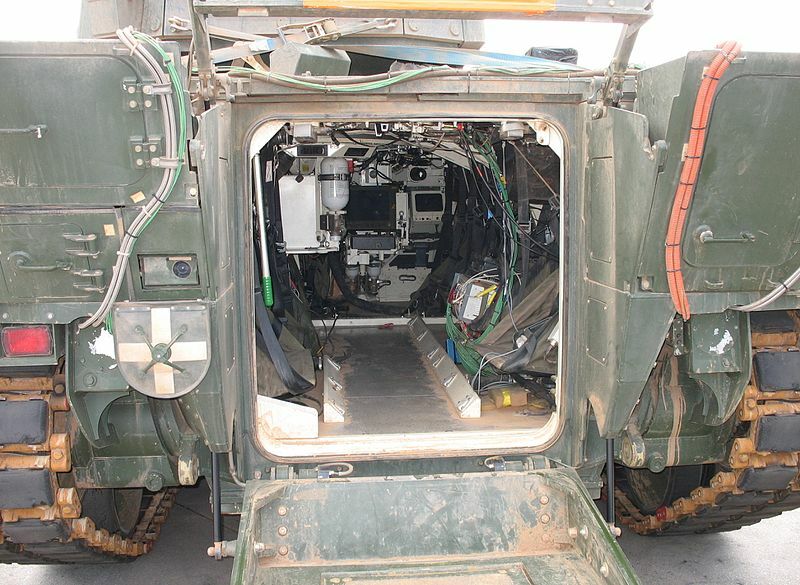 It can carry 6 combat-ready troops in the rear compartment and exit through power-operated ramp at the rear. The entire vehicle is coated with a special IR-suppressing paint which reduces its thermal signature and makes it difficult for hostile missiles to target it. The crew compartment is air-conditioned, NBC protected and has a fire suppressing system which uses non-toxic agents. The engine compartment is provided with its own fire extinguishing system for additional safety. The Puma is equipped with a mix of heavy and light guns, grenade launchers and has the provision for anti-tank missiles to be mounted. The primary weapon is a stabilized 30 mm autocannon from Rheinmetall which can fire a variety of rounds like High Explosive (HE), Armour Piercing (AP) and Air Burst (AB). It can fire accurately and effectively up to a distance of 3000 m and 400 rounds are carried on board. The secondary gun is the 5.56 mm x MG4 machine gun. It is unusual for a weapon of this caliber to be mounted as the popular choice is 7.62 mm, but the Germans went ahead with the 5.56 as it was smaller and allowed a large number of rounds to be carried on board (2000 rounds). This gun is used to engage soft target up to 1000 m range and anything further than that will be engaged by the main 30 mm cannon. There are 6 x 76 mm grenade launchers mounted on each side of the turret. The up-armoured turret provides extensive protection for the gun barrels. The 30 mm gun barrel is completely enclosed in a metal casing which has a series of small openings for air cooling of the barrel. The 5.56 machine gun disappears from view and the armour casing covers it entirely, leaving a tiny exit hole for the gun barrel. This ensures that the weapons aren’t damaged by hostile small arms fire or grenade fragments. The weapon targeting is done by a sophisticated sighting system which includes a mix of Optical, IR and Night vision sensors. This package is placed next to the 30 mm gun and is protected by a sliding armour panel which is vital as small arms fire and shrapnel can damage these sensitive instruments and blind the gunner. There is a provision to mount the Israeli spike Anti-tank missile on the side of the turret as a pack of 4. This, along with the 30 mm gun firing AP rounds can turn the Puma into a potent anti-tank platform which can protect the disembarked troops from enemy armour without having to rely on external fire support. A CGI of a Puma firing Spike. Note the launcher box on the left side of the turret. Cameras, cameras, everywhere! That’s literally how the Puma has been designed. As marked in the photos, the Puma has a minimum of 6 cameras of varying sizes and magnifications which provide 360-degree coverage of its surroundings. The commander has his own camera mast which contains a variety of sensors like IR and night vision devices to augment his camera. The gunner has his own camera unit with similar features right next to the guns. The best part is that all these cameras are protected by sliding armour panels. 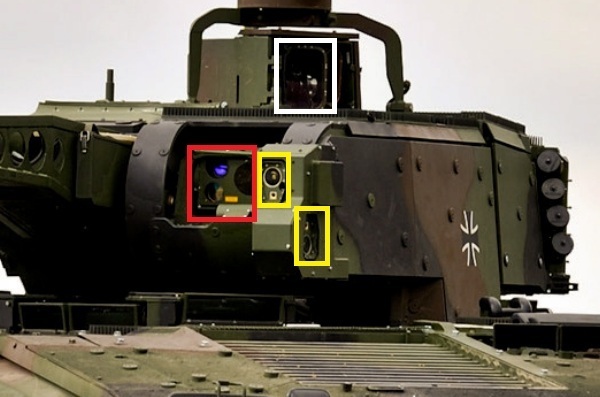 The driver too gets his own set of cameras and which are smaller than the others and are located around the turret for all round visibility while driving. The gunner can use the commander’s camera unit to aim his guns if his cameras are damaged and the driver can do the same. A large number of sensors thus ensures redundancy which is very important in a battlefield scenario. Puma with only its base armour. Note the unprotected gun barrel and lightly protected sides. Puma with AMAP armour. Note the heavily protected sides and gun barrel. The armour of the Puma has been designed keeping modularity and flexibility in mind. The modular nature of the AMAP (Advanced Modular Armor Protection) composite armor allows it to be configured based on the threat level which will be encountered during a mission. The AMAP is 4th generation composite armour, made up of nano-ceramics, Aluminium-Titanium alloys, and modern steel alloys. The Puma weighs 31.5 tons with its base armour which gives protection from 30 mm shells and shaped charge projectiles in the frontal and rear arc and 14.7 mm rounds all around. It can be airlifted in the A400M transport in this configuration for rapid deployment. If additional protection is required, add-on armour increases protection to a very high degree and brings the weight of the Puma to 43 tons! This makes it heavier than the 42-ton T-72 tank which shows the level of crew protection that the Germans focus on. The Puma would have easily been the heaviest IFV in the world had it not been for Russia’s T-15 IFV which weighs 50 tons. The Puma with add-on armour can withstand hits from medium caliber projectiles like 120 mm HE tank shells all around. Puma undergoing hot weather trials in the UAE. The Puma has been designed in such a way that there are a lot of options for future upgrades. There are provisions to mount hardkill Active Protection Systems to defeat hostile ATGMs or RPGs. The Bundeswehr will eventually acquire around 350-400 Pumas. Since they have performed well in the cold trials, Canada is considering the Puma to complement its fleet of Leopard 2 tanks. With further upgrades in the future, the Puma will easily remain the best IFV on the market. The main gun (30mm canon) looks like air defense gun , is it ??? It looks like that because of the barrel exterior coverings. most of these contents were all before 40 years technology.not up dated ..
Write more articles on indian defense forces and its equipments, future plans etc. Good text,maybe next time more interior pics. The IFV also uses 5.56mm ammo, because the main rifle of the german Infantry uses 5.56mm. The thinking is, that Soldiers could, if necessary, exchange ammo with their transport vehicle. 2. The Gun-Barrel is NOT armored! The construction around it ist a “Rohrabstützung” means barrel-stabilisation to fullfill the high demands on precise firing the german army had. It may too, protect the barrel, but isnt ment for that originaly. 3. The so designated “Driver Cameras” in the turret, are Sensors for the softkill System MUSS!